The Renewable Energy Certificates (RECs) assigned to Greenbank Environmental can attract GST, depending on a few factors. RECs are generally owned by the OWNER of the property at the time of install, not the installer or supplier. The deal is between Greenbank and the owner. If a point of sale discount has been given by the installer or supplier, they are acting as the facilitator only. 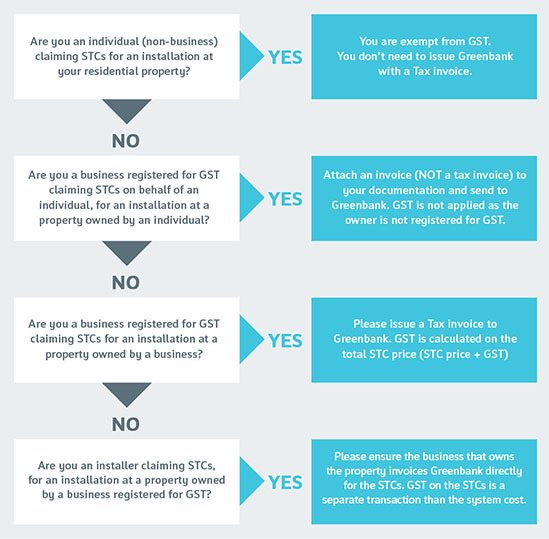 To find out more please visit the ATO website also please visit the REC Agents Association (RAA) website to read the briefing on GST paper. The table below explains the who, when and how of GST. (IMPORTANT: This table should be used as a guide only and you must consult your own accountant).